Basalt and Bluestone is an extruded igneous natural stone. It is the most common volcanic rock on the planet and is formed when basaltic lava flows cool. 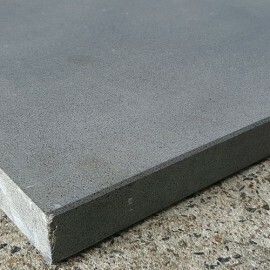 Basalt and bluestone is similar in density and strength to Granite and some basalts have been mistakenly sold as granite. The colour of bluestone typically ranges from grey to charcoal. There are two distinct building materials called "bluestone" in Australia. In Victoria, what is known as bluestone is a basalt or olivine basalt. It was one of the favoured building materials during the Victorian Gold Rush period of the 1850s. In Melbourne it was extracted from quarries throughout the inner northern suburbs, such as Clifton Hill, Brunswick and Coburg, where the quarry used to source the stone for Pentridge Prison is now Coburg Lake. Bluestone was also sourced in many other regions of the Victorian volcanic plains, and used in towns and cities of central and western regions, including Ballarat, Geelong, Kyneton, Port Fairy and Portland. It is still quarried at a number of places around the state. A number of significant bluestone buildings exist, including the Old Melbourne Gaol, Pentridge Prison, St Patrick's Cathedral, Victoria Barracks, Melbourne Grammar School, Deaf Children Australia and Victorian College for the Deaf, Vision Australia, the Goldsbrough Mort warehouses (Bourke Street) and the Timeball Tower, as well as St Mary's Basilica in Geelong. Some examples of other major structures that use bluestone include Princes Bridge, the adjacent Federation Wharf, and Hawthorn Bridge. Because of its distinctive qualities, post-modern Melbourne buildings have also made use of bluestone for nostalgic reasons. These include the Southgate complex and promenade in Southbank, Victoria, and apartment buildings such as the Melburnian. In South Australia, the name bluestone is given to a form of slate which is much less durable than Victorian bluestone, but was valued for its decorative appearance. The interior of the stone is usually pale grey or beige in colour, but is given attractively coloured surfaces by ferric oxide and other minerals deposited in joints and bedding planes. The slate is laid in masonry with the mineralised surfaces exposed. Bluestone was most popular from about the 1850s to the 1920s, quarried in the Adelaide Hills at Dry Creek, O'Halloran Hill (formerly Tapley's Hill) and Glen Osmond, and a number of other places in rural areas. Bluestone Tile and Paver There are 7 products. 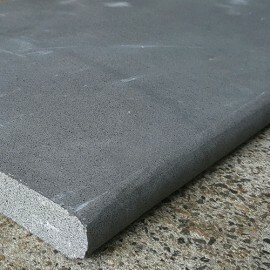 Bluestone Sawn Paver (No Cat Paws) Price per square metreThe sale price is only for the limited available quantity.